Use extreme caution when spraying anything around your gliders. A lady that adopted two rescues from me earlier this year called this morning, one of them was distressed and breathing hard. She took him to the vet college and they did some X-rays, checked his mouth. Put him in an incubator with oxygen. What they found was that his Larynx was swelling up blocking his airway. They medicated him with steroids and put him back in the incubator with oxygen. They had no explanation as to what caused this. Have you sprayed any bug spray in your house trailer? Ummm, Yes, my boyfriend sprayed hospital strength Lysol spray in the room because one of the kids threw up. He sprayed the air too. I told her to call the college back and let them know about him spraying the air with the hospital strength Lysol. 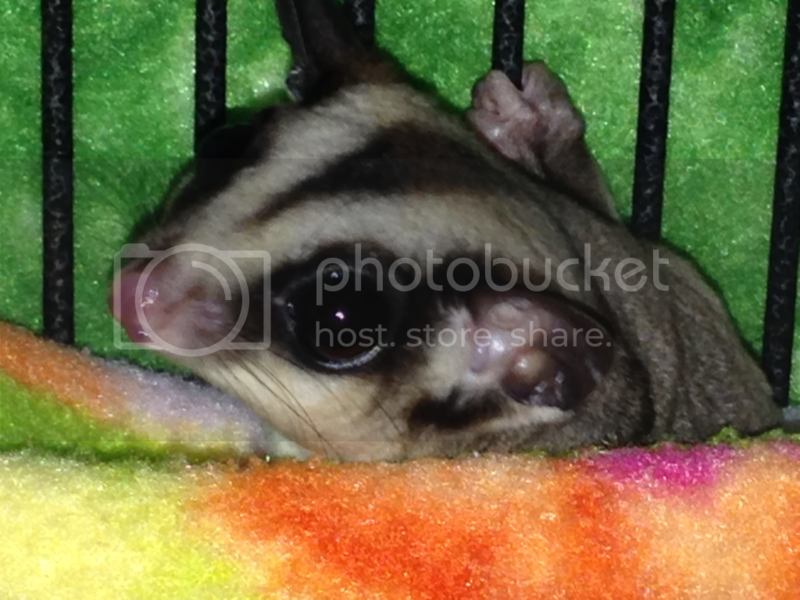 Any kind of aerosol spray can irritate your sugar gliders airways and cause this kind of reaction. Please use extreme caution when using stuff like this around your sugar gliders and other pets, specially parrots and small birds. Thats horrible, i hope those babies are ok. Fish tanks too on the caution list. Thanks for posting the warning. I hope the baby is okay, please update us on his recovery. I called the college to make an appointment for another glider to be seen Friday, so I asked the vet tech how he was doing. He isn't the best, they can find no trauma to him and can't explain why he is having a hard time breathing. He is also now exhibiting some neurological signs. His owner will be calling me with another update tomorrow. Hopefully he doesn't have to be euthanized as this glider helps her autistic son. Sadly this glider had to be euthanized. Preliminary necropsy results show hemorrhages in the lungs. I will post more when I get the final necropsy. I never even thought about spray hurting them!! My girls live in my room, do you think my perfume could hurt them? I don't spray it a lot and never next to their cage but it's in the same room. I think your ok, just stay away from their cage while your spraying the perfume. Her boyfriend had sprayed the whole room with hospital strength lysol type spray. Poor thing! I've always been cautious about that stuff but then it bothers me to have sprayed in excess. Then on the other hand my gliders don't like certain smells. I had to stop wearing my body spray and change my body wash and shampoo because they'd bite me with certain ones!